So that means I am still enjoying summer-type foods. I still use my outdoors BBQ pretty much daily, have chilled soups and refreshing salads. I actually haven't cooked any "fall food" yet. 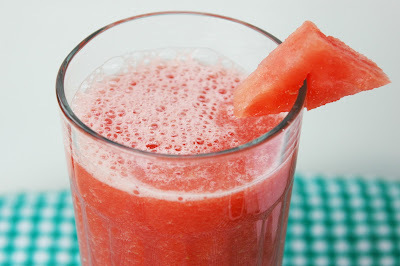 Today it was warm, and I decided to make this juice which is very refreshing on a warm day. I actually make this drink every summer, several times.But that doesn't mean it can't be enjoyed when the mercury drops a little bit. Besides, if you are getting a typical fall-entering cold or flu, the ginger in this juice will help you feel better. I used one of those personal size seedless watermelons. It doesn't mean they are really seedless, it means it has less seeds than a regular watermelon. I chopped the watermelon into chunks. Peeled and grated a 1-inch piece of fresh ginger. Blended it all with a teaspoon of honey. If you want to, you can strain the juice, I normally don't bother, unless there were a lot of seeds in the fruit. Refrigerate and serve very cold. This a great healthy snack, a good addition to the breakfast table and for me it also works as a decaffeinated pick-me up drink. I thinkit's all the frsh ginger in it, it really wakes me up! 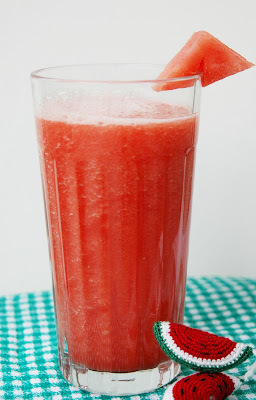 Oh I am so jealous of your summer weather and this yummy drink! 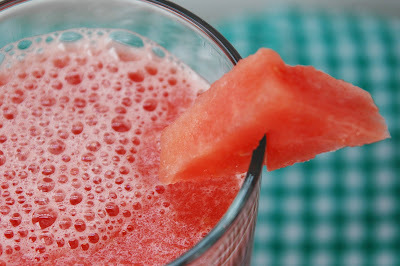 Holler - Can't help with the weather, but the drink is easy to make! Christy- Thanks, it is really good, you really sould try it.